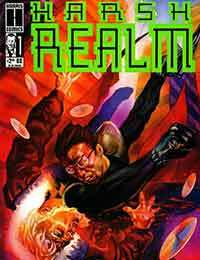 Harsh Realm Average 0.00/5 - out of 0 total votes. Harsh Realm was a series from writer James Hudnall and Andrew Paquette. Set in the future where virtual realities exist, the Harsh Realm was a unsupervised virtual reality where anything goes. Private Investigator Dexter Green is hired to enter the Harsh Realm to look for the missing son of a wealthy family. The series was loosely adapted into the short-lived FOX television series Harsh Realm in 1999.